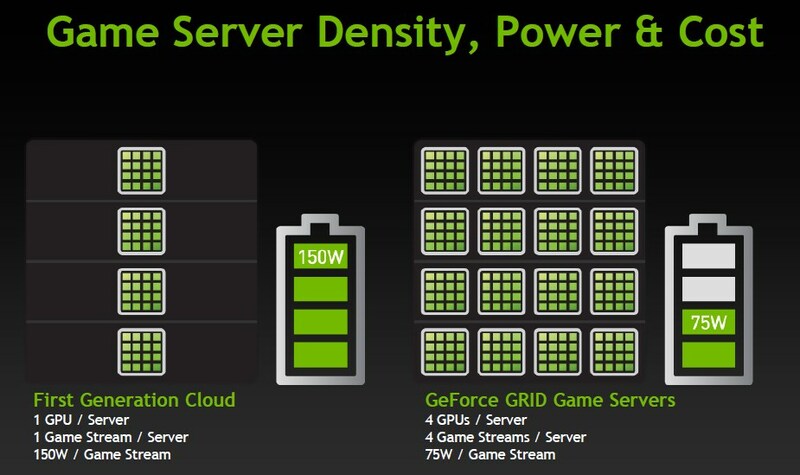 At GTC 2012 (GPU Technology Conference), NVIDIA CEO Jen-Hsun Huang in his keynote speech unveiled the NVIDIA Geforce GRID cloud gaming technology intended to power data centers of cloud gaming companies. 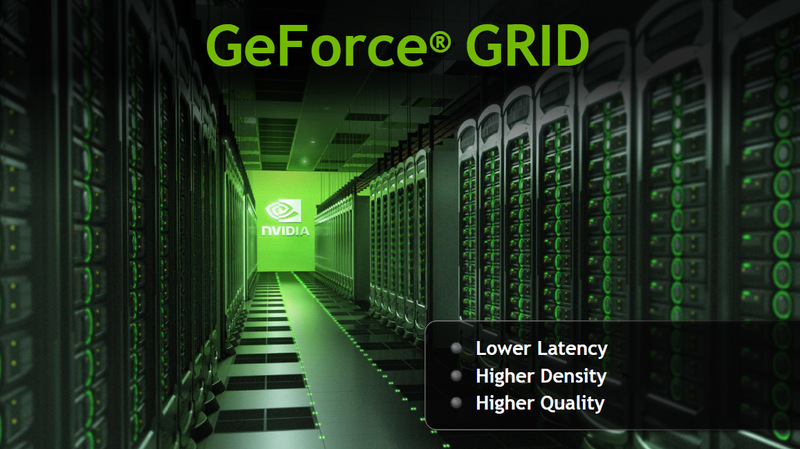 NVIDIA Geforce GRID is based on NVIDIA's new Kepler GPU architecture that also powers the latest NVIDIA gaming GPUs like the Geforce GTX 680. 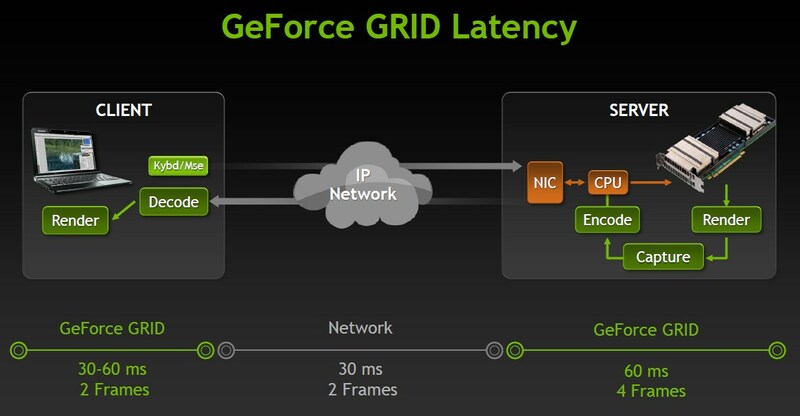 Geforce GRID is also one part of a larger cloud computing initiative at NVIDIA, the other part is NVIDIA VGX that is primarily meant for enterprises who want to deliver remote desktop connections to GPU powered servers that reside in cloud computing data centers. Both are based on the new Kepler GPU architecture, Geforce GRID is meant for cloud gaming companies and VGX is intended for delivering cloud computing services for enterprises. You can read more about the introduction of NVIDIA VGX. Five years in the making, NVIDIA's cloud GPU technologies are based on the company's new Kepler GPU architecture, designed for use in large-scale data centers. Its virtualization capabilities allow GPUs to be simultaneously shared by multiple users. Its ultra-fast streaming display capability eliminates lag, making a remote data center feel like it's just next door. And its extreme energy efficiency and processing density lowers data center costs. "Kepler cloud GPU technologies shifts cloud computing into a new gear," said Jen-Hsun Huang, NVIDIA president and chief executive officer. "The GPU has become indispensable. It is central to the experience of gamers. It is vital to digital artists realizing their imagination. It is essential for touch devices to deliver silky smooth and beautiful graphics. And now, the cloud GPU will deliver amazing experiences to those who work remotely and gamers looking to play untethered from a PC or console." The final part of the GTC 2012 keynote speech of NVIDIA CEO Jen-Hsun Huang was reserved for the introduction of the NVIDIA cloud computing technologies. First up was NVIDIA VGX for enterprises and the final part of the keynote speech was devoted to cloud gaming and NVIDIA Geforce GRID. As part of the Geforce GRID announcement Jen-Hsun Huang proclaimed that NVIDIA has partnered with cloud gaming provider Gaikai and Gaikai will upgrade their data centers with the new Geforce GRID cloud gaming technology. A little later Jen-Hsun Huang invited his old pal since his game developing times, Gaikai CEO David Perry to the stage to talk about the benefits of cloud gaming and NVIDIA Geforce GRID, and to demonstrate Hawken. Hawken is an innovative Unreal 3 engine powered free-to-play multiplayer online game where players battle giant armored mechs amongst the ruined cities of a toxic planet. You can read more about Hawken coming to Gaikai. Hawken was demonstrated streaming from a data center 10 miles away on a NVIDIA Tegra 3 powered Transformer Prime tablet hooked up to the main video wall and on a large LG Smart TV. 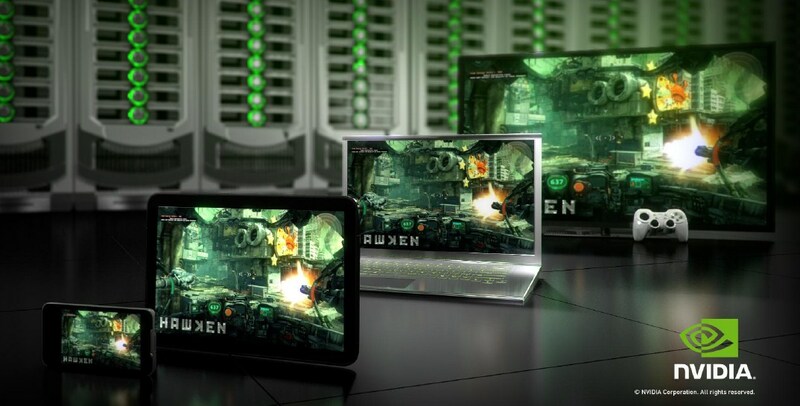 Hawken is also part of a virtual game console that NVIDIA and Gaikai demonstrated at GTC 2012. 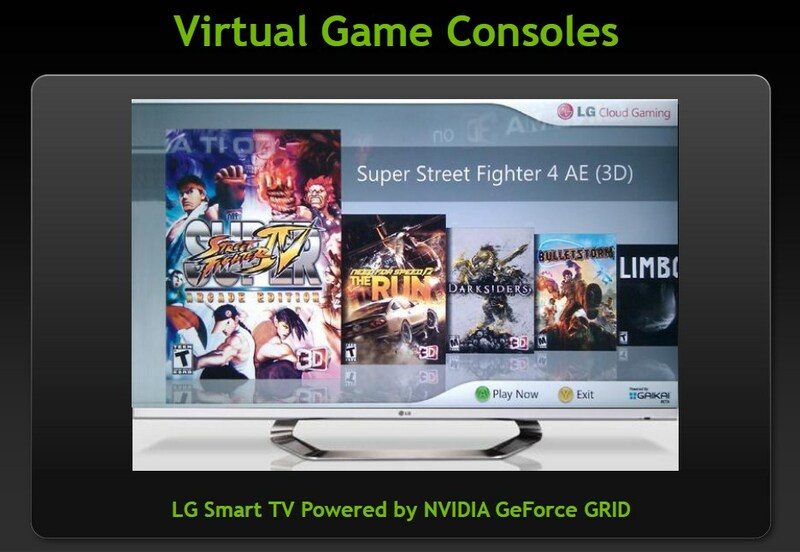 The virtual game console demo consisted of an LG Cinema 3D Smart TV running a Gaikai application connected to a Geforce GRID GPU in a server 10 miles away. Instant, lag-free play was enabled on highly complex PC games, with only an ethernet cable and wireless USB gamepad connected to the TV. Gaikai also announced that it's working in partnership with NVIDIA to produce content for Geforce GRID hardware. NVIDIA is considering offering Netflix-like subscriptions to Geforce GRID, with something like a $10 monthly fee for access to the streaming game catalog — such a move would put the service in direct competition with the OnLive PlayPack, a $9.99/month (£6.99/month UK) streaming game catalog consisting of a growing list of over 200 games. "Not so long ago, engineers said cloud gaming was impossible, and that it was not possible for cloud gaming to be as fast or high-quality as local, console-based gaming. Obviously, they didn't know that Gaikai and NVIDIA would be working together. We're proving the doubters wrong," said David Perry, CEO at Gaikai. Apart from Gaikai, NVIDIA has also partnered with other cloud gaming providers like OTOY, Playcast, G-cluster and Ubitus to provide them with the Geforce GRID cloud gaming technology. "Cloud rendering is the future of software delivery in our post-PC world and OTOY's cloud platform with NVIDIA's Geforce GRID technology brings cloud rendering to the mainstream, delivering unlimited rendering power to next-generation games and 3D apps on every internet-connected device, regardless of hardware or operating system", said Jules Urbach, CEO and Founder of OTOY. "Just like iPhone games have taken over the handheld games market because of ease of use, cloud gaming will expand gaming by making it incredibly convenient," said Guy de Beer, CEO at Playcast Media System. 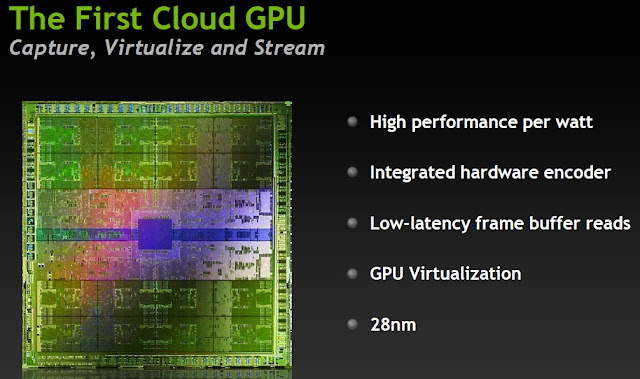 "We have worked closely with NVIDIA to use the Geforce GRID processor architecture in Ubitus GameCloud. Ubitus delivers highly scalable cloud gaming solutions with a native-like gaming experience for service providers," said Wesley Kuo, CEO at Ubitus. Gaikai's greatest rival in the cloud gaming arena, OnLive, is also partnered with NVIDIA for some time and uses NVIDIA GPUs in their data centers. OnLive is currently evaluating the NVIDIA Geforce GRID cloud gaming technology as evidenced by this tweet that NVIDIA made, "@brianblau @MrAdyCarter tks, we’re def familiar with OnLive. In fact they currently use Geforce GPUs and are evaluating Geforce GRID #gtc12". OnLive uses their superfast, power efficient, dirt cheap to produce and tried custom video encoder chip that can encode video in 1ms at 60fps. But it would be great if they'd get the new GeForce GRID GPUs because they are the by far most powerful and power efficient GPUs on the market currently. And they are optimized for the lowest possible latency game rendering and video output. Some are implying that OnLive should fully upgrade their data centers to the NVIDIA Geforce GRID platform, but I wouldn't dismiss OnLive's custom video encoding chip so fast, as OnLive has multiple times reiterated that it's capable of a 1ms encoding time at 60fps and they had time tuning it for many years. OnLive's custom video algorithm is more forgiving regarding internet connections, that's true for speed, latency and errors. OnLive video decoding is also less demanding on systems than H.264 and therefore requires less power on computers and can be used on older PCs, tablets and smartphones. Gaikai's H.264 based video algorithm has higher requirements for speed, latency, errors and compute power, so it isn't able to reach that many users as OnLive. People often wonder how they can't watch smooth YouTube videos on mobiles when they can play HD games streaming from OnLive. NVIDIA and OnLive are partners, it's in NVIDIA's interest to sell as much GPU hardware as possible, so why wouldn't OnLive be able to purchase the new Geforce GRID GPUs and still use their custom video encoding chip. Of course another story is if NVIDIA would be able to supply said GPUs currently, if they can't keep up with demand from retail. The problem of keeping up with demand has lately cost NVIDIA dearly, as they have the by far best GPUs with Kepler and Apple wanted to purchase them big time for the new Macs but NVIDIA couldn't fulfill their demand because they are bound by TSMC's limited 28nm chip production capacity and it doesn't look like TSMC will get substantially more production capacity on 28nm chip production any time soon. So Apple had to walk away. NVIDIA and Gaikai announced that this August Gaikai will upgrade all of its data centers, which already run with NVIDIA Geforce technology, to the new NVIDIA Geforce GRID. As Geforce GRID is based on the 28nm Kepler graphics cards I wonder if by August they mean they will start upgrading the servers to the Geforcre GRID tech then or they'll be finished. Because August sounds mighty optimistic when you consider that currently NVIDIA is not able to produce many Kepler GPUs and fulfill demand, because of the TSMC production issues. The NVIDIA GeForce GRID cloud gaming platform, will allow Gaming-as-a-Service (GaaS) providers to stream next-generation games to virtually any device, without the lag that hampers current offerings. Gaming PC GPUs get faster every year, while consoles only get updated every 5-10 years. So features and performance available to PC gamers outstrip even the best consoles. This includes support for features such as physics, tessellation, advanced antialiasing, and NVIDIA 3D Vision. With the GeForce GRID cloud gaming platform, Gaming-as-a-Service (GaaS) providers can deliver the most advanced visuals with lower latency, while incurring lower operating costs, particularly related to energy usage. NVIDIA GeForce GRID offers the promise of easy access to the power of an NVIDIA GeForce GRID supercomputer from the comfort of the living room. Gamers will be able to experience high-end PC titles on their TV with full features and effects turned on that will deliver incredibly rich graphics not possible before on a console. And because it's streamed from the cloud, this incredible gaming experience isn't confined to the living room TV—gamers benefit from the ability to stream and play the latest, most sophisticated games on any connected device, including TVs, smartphones and tablets running iOS and Android. The key technologies powering the new platform are NVIDIA GeForce GRID GPUs with dedicated ultra-low-latency streaming technology and cloud graphics software. Together, they fundamentally change the economics and experience of cloud gaming, enabling Gaming-as-a-Service (GaaS) providers to operate scalable data centers at costs that are in line with those of movie-streaming services. The Geforce user-selectable machine (USM) loads a complete server-edition NVIDIA GeForce GTX experience with industry-leading game compatibility and performance onto a real or virtual GPU. This machine image includes support for the latest game APIs, including DirectX 9, DirectX 10, DirectX 11, and OpenGL. It's also optimized for cloud gaming, with low-latency capture APIs for individual applications or the entire desktop, single-pass, low-latency encoding, and network-encoder optimizations. Cloud-service operators will also be able to improve the gaming experience every year as new GPUs become available and network performance improves. The possibilities are endless once game developers fully embrace the power of cloud gaming supercomputers and design games specifically for the awesome graphics processing power that these cloud machines deliver. NVIDIA's new Geforce GRID processors are specifically designed to deliver the best platform for cloud gaming services. GeForce GRID processors solve three main issues that prevented earlier GPUs from delivering a great gaming experience from cloud servers: GPU virtualization, low-latency remote display, and power efficiency. Together, these technologies create a significant shift in the performance, efficiency, and end-user experience for cloud-rendered games. Using the highly efficient NVIDIA Kepler architecture, NVIDIA GeForce GRID GPUs minimize power consumption by simultaneously encoding up to eight game streams. This allows providers to cost-effectively scale their service offerings to support millions of concurrent gamers. Optimizing performance per watt demanded an entirely new approach to power management. 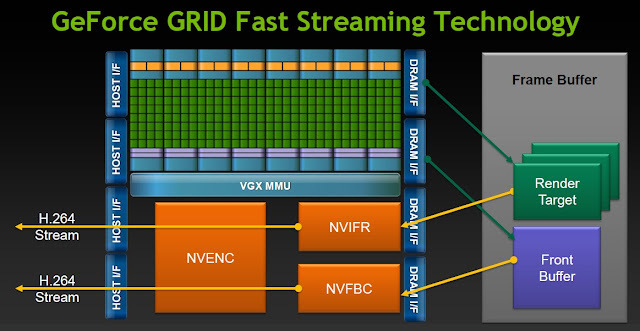 Every hardware unit in GeForce GRID has been designed and scrubbed to provide outstanding results, including the new streaming multiprocessor called "VGX". The result was an innovative solution that delivers revolutionary performance per watt for the cloud gaming services. Featuring two Kepler architecture-based GPUs, each with its own video encoder, the processors have 3,072 CUDA technology cores and 4.7 teraflops of 3D shader performance. This makes the Geforce GRID GPUs similar to the flagship NVIDIA Geforce GTX 690 dual-GPU graphics cards for gaming. But unlike the Geforce GTX 690, they feature 8GB of GDDR5 and 320 GB/sec memory through output. The Geforce GRID GPUs are rated at a 250W TDP. This enables providers to render highly complex games in the cloud and encode them on the GPU, rather than the CPU, allowing their servers to simultaneously run more game streams. Therefore, four GPUs can now be installed into a single game server with 4X the density of first-generation cloud gaming servers. Server power-consumption per game stream is reduced to about one-half that of previous implementations, an important metric for data centers. 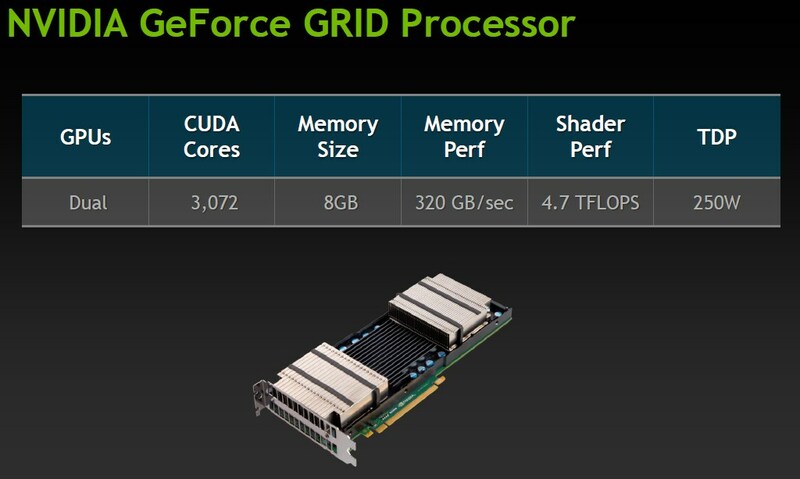 But I wonder what the cost of these Geforce GRID GPUs will be when NVIDIA is pricing the Geforce GTX 690 at $1000. These Geforce GRID GPUs can't be cheap and no bulk pricing can change this fact. The net result is a dramatic reduction in the amount of power consumed per game stream and the cost per game stream. It will now be possible for game-service operators to offer bundles of games for about $10/month, similar to the OnLive PlayPack or movie-streaming services like Netflix. Traditional remoting technologies have long latencies associated with the network, rendering, capturing, and video encoding in the server. The new GeForce GRID architecture addresses these delays with built-in, low-latency remote display capabilities. This performance advantage greatly benefits cloud gaming services by enabling super low latency delivery of a game. The Geforce GRID architecture also includes a high-performance H.264 encoder engine that's capable of encoding up to four simultaneous 720p 30fps streams with superior quality. This provides a giant leap forward in cloud server efficiency by offloading the CPU from encoding functions and allowing the encode function to scale with the number of GPUs in a server. Plus, the on-chip encoder can be fed in a single pass from the low-latency capture that creates the most efficient and lowest-latency architecture. Fast streaming technology reduces server latency to as little as 10 milliseconds -- less than one-tenth the blink of an eye -- by capturing and encoding a game frame in a single pass. The Geforce GRID platform uses fast-frame capture, concurrent rendering and single-pass video encoding to achieve ultra-fast game streaming. "Where we used to render from frame buffer and copy to the CPU for compression and streaming, here it's already streaming right out of the GPU, saving encode time, not to mention copy time. Compressing and streaming in parallel... we've taken maybe a couple hundred milliseconds of lag, and reduced it to something that's the same performance and snappiness as a game console," said Jen-Hsun Huang, NVIDIA president and chief executive officer. Nothing special is needed at the client-end, just a standard H.264 hardware video decoder. Anything that can play YouTube can run Geforce GRID-streamed games, Huang said. He did say that there are still optimizations possible at the client end to further reduce latency, though, but wouldn't confirm whether NVIDIA or partners were working on a Geforce GRID-specific client for the task. To a gamer, latency or lag can be the difference between life and death. 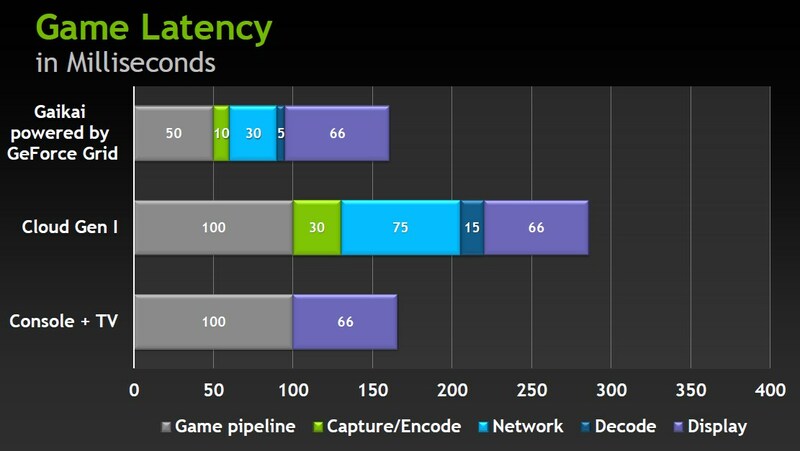 That's why NVIDIA has focused on reducing game server latency throughout the pipeline, achieving an amazing 30ms reduction with the Geforce GRID platform. The end result is that cloud gaming now feels like playing on a local console. There are also a few publishers and developers pledging support for Geforce GRID from the start, including Epic, Capcom, THQ, SEGA, Gearbox Software and CD Projekt RED. "Cloud has the potential to deliver an even more powerful experience in the future by enabling ultra-high-end GPUs like the Geforce GTX 680 to stream ultra-high-quality graphics such as those made possible by Unreal Engine 4 to a huge range of devices, well beyond console capabilities. The result will be that more people can enjoy EPIC's games on more devices at higher quality," said Tim Sweeney, founder and CEO at EPIC Games. "The compelling advances that Geforce GRID introduces to cloud gaming are especially beneficial to Capcom game fans, as we are focused on delivering AAA action games that are reliant on low latency for the best experience. We are, therefore, very excited about NVIDIA's contributions in this space," said Masaru Ijuin, deputy general manager, Technology Research and Development at Capcom. "Online gaming with underlying cloud infrastructure is an important part of modern games. Cloud gaming is an exciting new way of delivering games to streaming customers. In reviewing NVIDIA's Geforce GRID, I see the potential for this technology to reduce some of the latency issues that affect game streaming. This is an exciting development," said Juancho Buchanan, vice president of Technology at THQ. "While cloud game streaming services offer a viable means to enjoying games, Geforce GRID distinguishes itself from other implementations by dramatically addressing two major limitations in existing cloud technologies -- latency and image quality. We greatly welcome the profound advancements that Geforce GRID brings to the cloud gaming platform. Thanks to Geforce GRID, the day will soon arrive when many of SEGA's titles will become available via streamed content. We are excited about the prospects of enabling a broad base of users to enjoy our key franchises the way we intended them to be enjoyed -- with beautiful visuals and speedy response times intact," said Masaru Igarashi, Department Manager, Network Business Dept. at SEGA. "Gearbox Software has long been an advocate and partner of cloud gaming and the evolution of software technology optimized for remote simulation. NVIDIA's Geforce GRID signals not only the growing opportunity with the cloud gaming approach, but also promises to radically increase performance and quality of applications using NVIDIA's new cloud gaming optimized technology," said Randy Pitchford, President at Gearbox Software. "It is exciting to watch how cloud gaming is becoming mature and gives a better and better user experience -- and NVIDIA's Geforce GRID technology is an example of it. We are looking forward to see how cloud computing using this technology will change the future of gaming and the overall gaming experience and how it will affect consoles and PCs," Bartlomiej Wronski, lead engine programmer at CD Projekt RED. Since this article is about NVIDIA, the question is near what AMD, their greatest rival in the GPU business is going to do about cloud gaming. Actually they have done something a while ago by announcing their fusion render cloud and partnering with OTOY. But, AMD uses to announce a lot of things, but from many of them we don't hear a peep afterwards, because the company lacks focus. So it's no wonder that OTOY switched from AMD to NVIDIA. Wouldn't it be for the arab oil money that was poured into them cough... drained back down into a bottomless pit and because Intel fears the US antitrust laws, I don't think the company would exist anymore. It's like with AMD's mobile plans. They used to talk a lot what they will do on the mobile front, but then NVIDIA launched the Tegra line of mobile chips, AMD got into panic mode like a bunch of headless chicken and some heads rolled in the highest executive positions. I don't think that NVIDIA will try to launch their cloud gaming service and create a cloud gaming console, but I might err because they have great connections with game developers and help them to make their games work on NVIDIA hardware. But, NVIDIA is still primarily a hardware design company, though the number of software engineers employed by them outweighs the number of hardware engineeers. I've always wondered why NVIDIA doesn't have a first-party game development studio, that way they could sell even more of their GPUs. Maybe this entry into cloud gaming is the perfect time for NVIDIA to build a cloud gaming service and a game development studio. From NVIDIA's announcement of the Geforce GRID platform I took away that they primarily intend to be a white-label service for cloud gaming companies, but hardware and software technology wise, not like Gaikai who wants to be a white-label hosting service for other cloud gaming companies. NVIDIA has great connections with game developers and the movie industry. They are able to produce great graphics tech demos. I also think they are very agile as a company and know that cloud gaming is the next big thing. Since they have been cut out of the next-gen consoles by AMD, they prepare to strike back by getting the grip on cloud gaming which has the potential to wipe consoles and PCs off the face of the earth. NVIDIA is a clever company that has managed to adapt and survive countles battles in the harsh reality of the computing business environment with larger and arrogant companies like Intel and AMD. It is of utter importance for NVIDIA to be able to predict the future. Since AMD has locked them out of next-gen consoles and Intel from producing x86 chips, they first tried to land on the mobile market with Tegra and they have some moderate success with it. But, NVIDIA's core business are big badass GPUs and cloud gaming companies need such GPUs like water in the desert. Like cloud gaming companies NVIDIA has smelled blood and they see that their stronger and arrogant but slow-acting competition hasn't fully embraced cloud gaming. NVIDIA clearly sees the writing on the wall and that they can put truckloads of high-end GPUs with custom NVIDIA technology like CUDA into cloud gaming data centers, make the cloud gaming providers big, and slowly starve out consoles and PCs and subsequently AMD, Intel and many others which have delivered pain to NVIDIA in the past. Did you know that you can create short urls with AdFly and get $$$$ for every click on your short urls. DreamHost is one of the best web-hosting provider for any hosting plans you might need.